If every journalist wrote like Patrick Kingsley, more people would likely be reading the critical nonfiction books of our time. 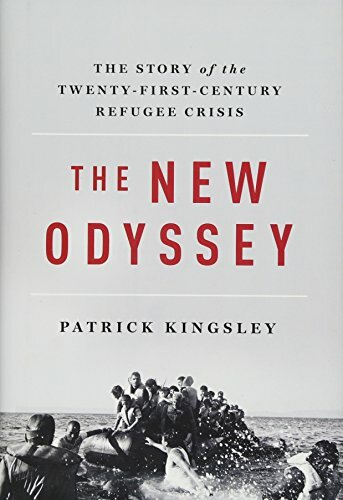 Kingsley writes with clarity and compassion as he puts a human face on the largest mass migration the world has experienced since World War II. He also does an excellent job of deconstructing all that is wrong with the world’s approach to the refugee crisis and offers constructive ideas to remedy the situation within a realistic framework. The journeys taking place by individuals and families from Syria, Africa, and other places of destruction and hopelessness documented in this important book are heartbreaking. Kingsley has done a great service by painting a portrait of what is happening as desperate people continue to risk death to escape tyranny while the world responds in a totally inadequate way. The stories of suffering and heroic attempts to end that suffering that Kingsley tells are classically archetypal. There are heroes, villains, mentors, nurturing mothers and more character types. Catalytic events motivate risk-taking, dangerous quests for a better life. Myriad obstacles must be overcome. Bodies of water need to be crossed. There is darkness, both literal and symbolic, to be endured. Success means rebirth. Defeat often means death. Kingsley traveled to 17 countries across three continents with people whose stories he tells. Most compelling among them is Hashem al-Souki, a Syrian who tried three times to reach Sweden while his family waited nervously for news from him. In alternate chapters, we walk with him, travel by boat and train with him, suffer sleepless nights in chilling weather, worry about his family, wonder what the outcome will be. We share his fear and despair. We hold our breath with him as border guards approach. We want to offer him solace. And he is just one of the people we are introduced to whose suffering is nothing short of biblical. Statistics reveal a growing crisis. For example, from 2014 to 2016 nearly 1.5 million people crossed the Mediterranean in leaky boats. In 2015 more than 850,000 refugees left Turkey alone, most of them marching northward through the Balkans. That year the refugee crisis came to a head. Nearly 4,000 people drowned while crossing the Aegean. Countries like Greece, Italy, and Hungary found themselves unable to cope while many countries ignored the problem, pretended it wasn’t happening, or sought ways to ensure they weren’t overly affected by the “huddled masses yearning to be free.” The U.S., which had taken hundreds of thousands of refugees after Vietnam, now promised to take a mere 10,000 Syrian refugees. Every person Kingsley meets has suffered an unimaginable and deeply traumatic ordeal, ranging from trekking across a desert with insufficient food or water, being tortured, abused, and humiliated by various authorities, getting ripped off by smugglers and surviving, often barely, days at sea in overcrowded, unsafe boats. So why do they still come? “There we know we will die. If we make it, there is at least hope,” the refugees say.